Add granola bars to blender or food processor and process until you have fine crumbs. 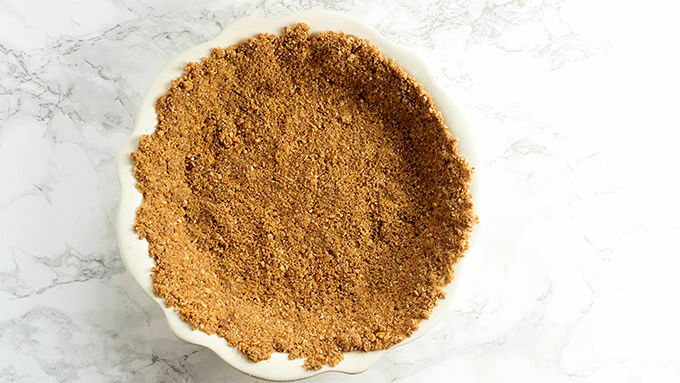 Remove to a bowl, setting aside 1 tablespoon of the crumbs for topping the pie. Stir melted butter into crumbs until well combine and press tightly into a 9-inch pie plate. Place in freezer for 10 minutes. Meanwhile, place cream cheese in microwave on microwave safe plate for 30 seconds to warm and soften. 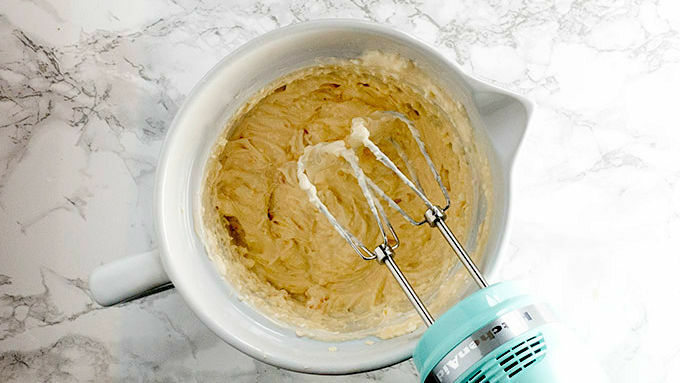 Add softened cream cheese, yogurt and powdered sugar to a mixing bowl and beat with an electric mixer for 1 minute or until smooth creamy, and combined. Fold in the peaches, reserving a few peaches for topping the pie. Spread filling into the prepared pie crust. 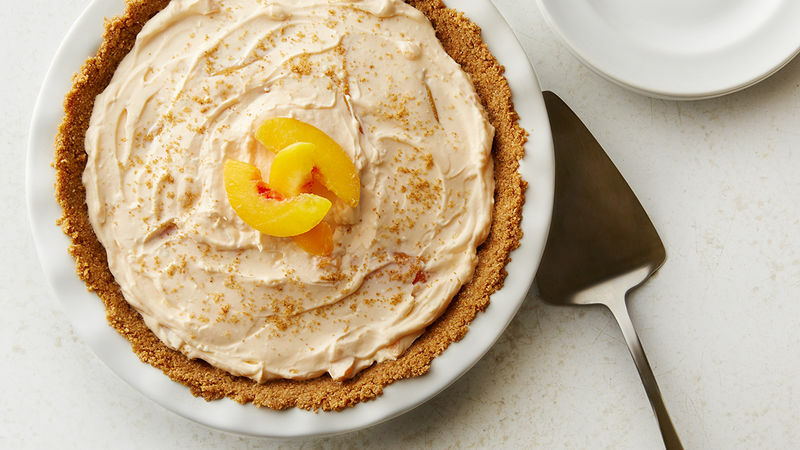 Top the pie with reserved peaches and granola crumbs. Do you know that feeling when you’re walking around the produce department in your grocery or wandering through a farmer’s market and you suddenly get this giant whiff of peach? Oh, that’s a good feeling. Peaches that have no smell generally seem to have no flavor. Walking by a fragrant pile of peaches makes me want to dive right in, because I know the ones that smell the best also usually taste the best! 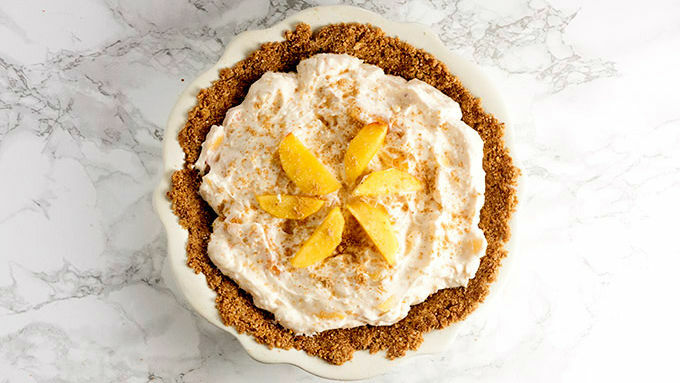 The other day I found myself sniffing out the good peaches in hopes of making this no-bake peach pie. It’s the perfect summer treat and I think you’re going to love how easy it is. This pie will need to chill out in the fridge for a couple of hours to firm up, but then you can dig right in. Fresh, summery peach perfection!